A stylish UK built and designed family cargo trike with many really useful accessories, especially for the safety conscious. The electric assist is of a high specification and for those who like to customise their ride, there are lots of striking colour options and box designs to choose from. Made to fit up to 4 children up to the age of about 8 years old, and options for carrying babies and toddler safely too. 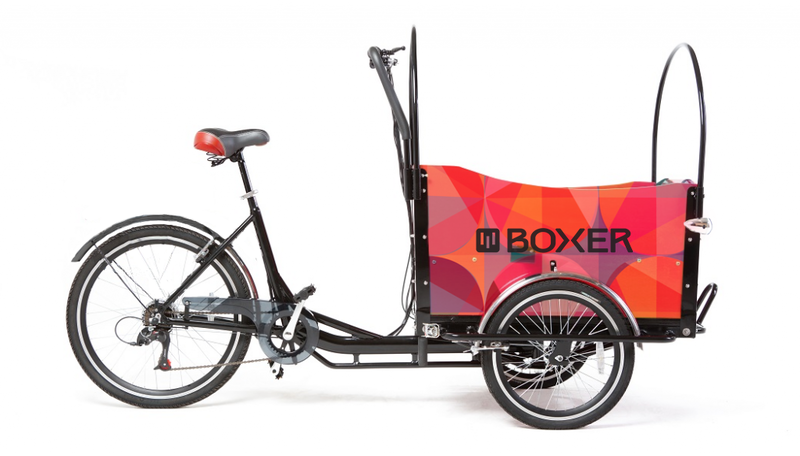 Highly functional extras to make your cargo bike life easy, including the removable front bumper, which slides out to allow the Boxer Children’s bike rack kit to be fitted or our stroller/pushchair mount kit. From dusk the trike is highly visible thanks to the front and rear battery lights. There is also an optional indicator lights options to really make sure the other road users know your are there. The price also includes some extra comfort with all benches coming with a 25mm foam bench cushions as standard.